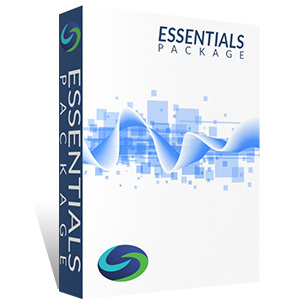 The Series 54 Total Study Package comes with Solomon's bestselling Exam Study Guide, Audiobook, industry-leading Online Exam Simulator and an excellent Video Lecture. 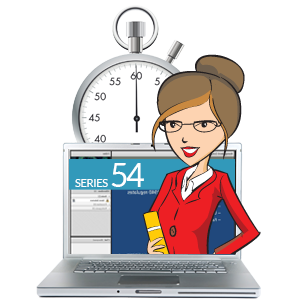 The Series 54 Video Premium Study Package comes with Solomon's bestselling Exam Study Guide, industry-leading Online Exam Simulator and an excellent Video Lecture. Solomon Exam Prep’s industry-leading Online Exam Simulator and Study Guide are a powerful combination that will give you what you need to pass the Series 54 exam. 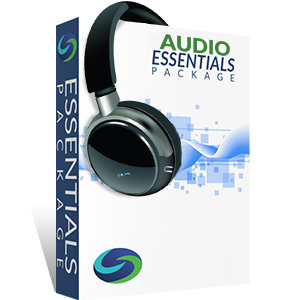 The Series 54 Audio Essentials Study Package comes with Solomon's Audiobook and industry-leading Online Exam Simulator to facilitate learning and knowledge retention. 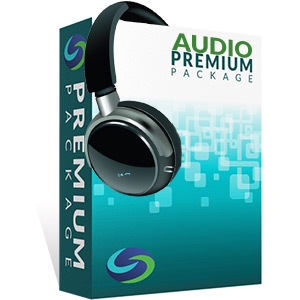 The Series 54 Audio Premium Study Package comes with Solomon's bestselling Exam Study Guide, Audiobook and industry-leading Online Exam Simulator to facilitate learning and knowledge retention. 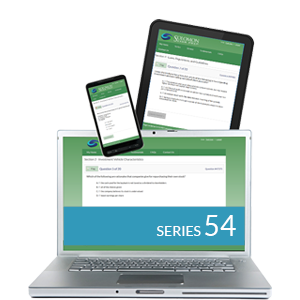 The Series 54 Online Exam Simulator is the industry-leading, online testing solution for the MSRB Series 54 Municipal Advisor Principal Qualification Exam! Having trouble nailing down the most important concepts for the MSRB Series 54 Exam? Our professor takes you through the most essential topics in this online Video Lecture. 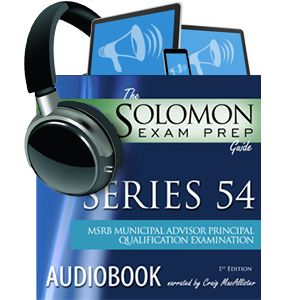 This three-hour audio recording of "The Solomon Exam Prep Guide to the Series 54" will give you the content of this invaluable and enjoyable study guide in an audio format. 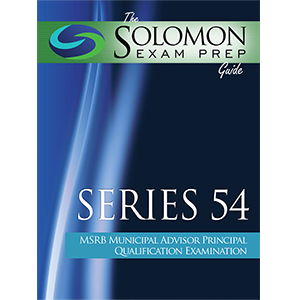 “The Solomon Exam Prep Guide to the Series 54” offers a comprehensive guide to the MSRB Series 54 Municipal Advisor Principal Qualification Examination. I passed the Series 65 with a 92% thanks to the Solomon practice exams. The questions on the practice exams were very similar to what I actually encountered on the actual exam, and the ability to take unlimited practice exams really built my knowledge and confidence. I highly recommend this product to anyone studying for the Series 65.